Battle on the beach 2018. Battle on the Beach? What’s that got to do with bikes I hear you ask. Well, it’s a bike race that takes place in Pembrey Country Park around this time of year, the beach element being the incredible Cefn Sidan beach which forms part of the course. Organised in the usual brilliant manner by bike events company, A Cycling, this year’s edition was blessed with a monster tailwind, yet cursed with some pretty heavy showers. Thankfully Team CTW, consisting of myself, Workshop Coordinator, Jon Howes and my 15 year old son Daniel, had managed to complete the race by the time that these rolled through, leaving us feeling both simultaneously smug and sympathetic as we watched many bedraggled riders arrive at the finish. 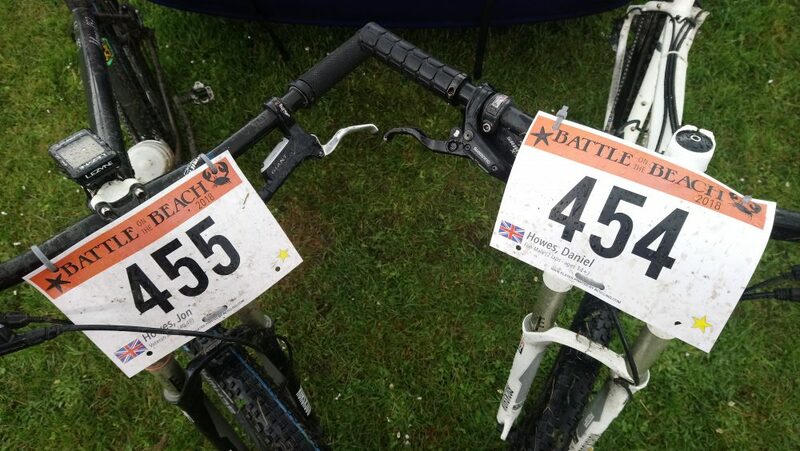 That smug feeling disappeared soon enough , once I began the MTB’rs ritual dance of getting changed in a rainy car park! That was the only blemish on the whole experience however. 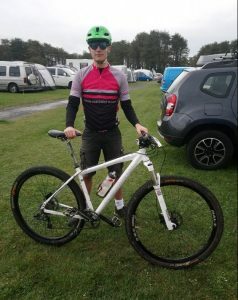 Daniel Howes ready to race at Battle on the Beach 2018. The race is unusual in that 6km of it’s 14km lap run along the length of the beach at low tide. Thanks to this it draws both a big and quality field, including a dedicated beach racing team from Holland. With 700 riders listed race we thought we should get to the line relatively early to ensure a good start and headed down with around 30 minutes to go. On seeing the number of riders already there we resigned ourselves to a cold wait and starting from the back. Soon enough we were ushered onto the beach proper and upto a very wide start line, many, many riders deep. Anticipation was keen, the atmosphere helped in no small part by lots of spectators and a very loud, brilliant band of drummers perched in the dunes directly behind us. Shortly the flag went down and the lead quad bike sped off along the sand. Of course chaos ensued, we all began sprinting hell for leather towards the harder sand slightly further down the beach, some tried to ride but got nowhere, some went for different lines in an attempt to get to to a rideable surface that bit quicker. Once on my bike I quickly ran out of gears as I tried to keep up with the riders all around me. People were passing me left and right and I was passing others too. After a few minutes things settled down into a long bunch as riders drafted behind others. I checked my speed and was amazed to see I was doing 45kmh. Pretty much unheard of on the flat! After around 35 minutes I began to hear the PA from the event arena, popped out of the woods and across the line to start lap 2. More of the same for two more laps! In total I raced 3 laps finishing in 1:43:22. My overall position being 224/661 and in the veterans category I was 88/249. Daniel raced two laps finishing in 1:13:21 and 15/35. We were both pleased with our races, Daniel particularly as it was the first one he’d done for a couple of years. The winner, Bram Imming, finished three laps in 1;13:29, clocking 36mph along the beach at one point. It has to be said that this is a brilliantly conceived and executed event. Congratulations to the team at A Cycling for a cracking job all round. It’s hard to get the balance between keeping it “serious” enough for professional and amateur racers alike, yet ensuring riders who don’t take things as seriously, enjoy themselves too. This event manages that magnificently! No doubt we’ll be back at this or one of the other A Cycling events in the future. 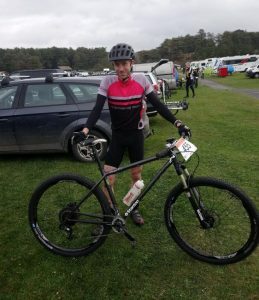 For Team CTW, the next event will probably be one or two rounds of the Welsh XC series and a DIY audax or two as I build up to Bristol Bikefest 6 hour race in June.